Genre – Adult, Fiction, Mystery. Miguel is Cuban American, with the accent on American. But beneath the surface of his sun-drenched Miami lifestyle lurks an evil that threatens to destroy him. The chance reading of a newspaper article reporting a stolen skull and the ritualistic murder of a petty drug dealer pitches Miguel into battle with an underworld dominated by santeria in this spell-binding and engrossing novel. Shangó is the Yoruba deity of fire, thunder and lightning. He was the fourth king of the ancient Oyo Empire, the West African center of culture and politics for the Yoruba people. Shangó was a feared and respected warrior; strong and powerful, dreadful and magnificent, he is the personification of masculinity. Notorious for his great sexual philandering, Shangó not only is passionate in love, but also is famous for his sudden changes in temper and potential for violent behavior. 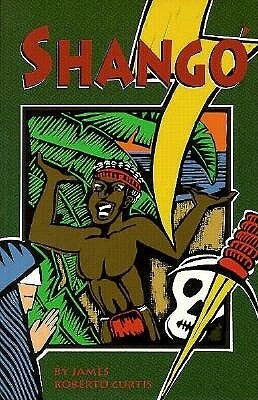 When a subordinate chief challenged his rule, many townspeople were impressed by the chief’s feats of magic and deserted Shangó. Defeated in the eyes of the majority of his subjects, Shangó left Oyo and committed suicide by hanging himself in the forest. His faithful followers, however, claimed that he really ascended to the heavens on a chain. They claimed that his disappearance was not death but merely the occasion of his transformation into an orisha or “black saint”. I really didn’t know what to expect going into this book, all I saw was Shango and I was immediately captivated, I even thought “oh this will be some marvellous West African book to read!” Because I love books that deal with African deities. Imagine my surprise when I realised I thought wrong and this book was actually based in the united states and instead of African people, it was filled with Cubans. It was a wonderful surprise (by the way) because it’s always intriguing and educative to see how my culture which I somewhat share with various other races and nations, is perceived. The story opens up with a gruesome scene, a ceremonial killing, which sounded so barbaric and definitely had to do with the worshipping of gods. Lieutenant Osvaldo Gutierrez was in charge of the investigation, and he immediately had an inkling it was related to rituals by the Santeria, an Afro-Caribbean cult. Knowing he couldn’t solve this case on his own, he turned to consulting with experts on the Santeria culture. Professor Henry and Miguel, his Cuban American grad student, who was writing his thesis based on the Santeria culture. This led to a story full of surprises, twists and turns. I would say more about the plot, but spoilers! Now about the story-telling, I found the voice of the narrator extremely soothing, and easy to follow, the pronunciation of words was very apt, I really loved the authentic feel of the narration, and how he changed his voice in many instances to fit the characters in question had me holding my side in laughter. The story wasn’t bad although in my belief I think the story could have been better and much more fleshed out, nonetheless, I enjoyed listening to this audiobook and I think you all should give it a try at Abantu Audio.